We think this watch has attitude. 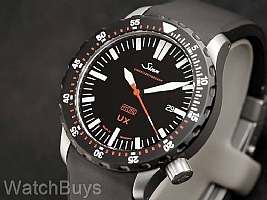 Sinn took all that's great about the Sinn UX and added an all new black bezel. This bezel has been fully Tegimented to 1,500 Vickers, or more than 7 times the hardness of standard stainless steel. The Sinn UX SDR pushes watch technology to the limits. Like the Sinn U1 and U2 watches, the Sinn UX SDR features a case made from the same submarine steel that is being used to build the latest generation of German military submarines. Unlike the Sinn U1 and Sinn U2, the Sinn UX SDR features a quartz movement rather than a mechanical movement. The Sinn UX SDR is covered with a thick sapphire crystal for extreme protection. This sapphire crystal features a special anti-reflective coating that is scratch resistant - the coating itself has been hardened to 1,800 HV. Verified Owner Comments: Looked for months deciding on a diver watch. The UX is now my favorite and worn daily. No issues whatsoever so far. Love the accuracy of the quartz movement and the legibility is superb! Watchbuys was a breeze to deal with as well. Verified Owner Comments: The Hydro gets a lot of wrist time. I ordered it on a bracelet and it's a looker. I usually get at least one nice comment every time I wear it. Verified Owner Comments: Purchased this timepiece a month ago and I am just amazed by the technology that has gone into it. An absolute great buy and I have been very pleased with the service from WatchBuys. Also purchased the Tegimented Steel band and do not want to take it off. This timepiece is so undervalued to what is out on the market and eventually that will change but hopefully not before I purchase another piece. Do yourself a favor, research the technology then put one on your wrist. Cheers. Verified Owner Comments: Have had the UX SDR for about two weeks and I must say it's a marvel of German engineering. I have a stable of the usual suspects (Rolex, Omega and Tag's) but since the UX arrived, the rest are locked up in the safe, and the UX is on my wrist. My only regret is now I'm hooked on Sinn, dictating that I order a bracelet for the UX and I'm eyeing the U2 as my next purchase. Solid watch, excellent build quality, best value in a pro dive watch and first rate service from WatchBuys - what else can I say!